Within a short time, the estimator will perform a complete inspection of your roofing project. You will meet with the certified estimator who will answer all your questions and explain our process from start to finish, including materials used and warranties. All Keith Miller Roofing and Remodeling employees are full-time, company employed craftsman in their respective trades. We guarantee you will be satisfied with the finished product these professionals produce. The work site is cleaned up daily and our workers are courteous, responsible and professional. They show up on time and begin work immediately. One of the most frequent compliments we receive from our customers is how responsible and well-mannered our crew is. If you have any questions during the project, the on-site job superintendent is available with an answer. Our crew is certified CertainTeed installers and Master Shingle applicators. Keith R. Miller, Inc. has achieved CertainTeed's highest credential level and is authorized to operate and represent itself as a SELECT ShingleMaster™, and can offer the CertainTeed SureStart™ PLUS warranty extensions. Earning this highest level credential involves a rigorous process, including several significant educational and accreditation steps. This mark of distinction separates SELECT Shingle Roofers from most other companies. CertainTeed keeps a record of each SELECT Shingle Roofer to ensure their credentials and insurance coverage are current. Thorough testing and regular re-accreditation ensure that all supervisors and at least 50% of the company's installers are Master Applicators™ (MSA). Information from the CertainTeed Shingle Applicator's Manual provides instruction to MSAs, making them some of the most knowledgeable roofing installers in the industry. One or more company employees have earned the Quality Master™ designation after passing a test on the CertainTeed Shingle Technology Manual, which proves their knowledge of shingle products, quality standards and satisfying customer objectives. The SELECT Shingle Roofer must carry workers’ compensation insurance, as required by law, and liability insurance covering roofing. This coverage is critical for your protection. These companies have been in business for a minimum of five years or held another CertainTeed credential for at least one year. 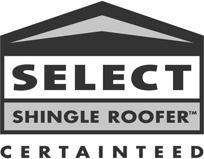 The SELECT Shingle Roofer agrees to abide by a code of ethics that covers compliance with applicable laws, standards of workmanship, customer service and business administration. This company is committed to uphold industry-accepted standards and business practices. The SELECT Shingle Roofer has the exclusive ability to offer you three levels of extended warranty protection. Ask about the extra protection available on your investment when an Integrity Roof System™ is installed.